As someone who facilitates workshops regularly, it is a treat to watch/experience someone else’s strong facilitation. 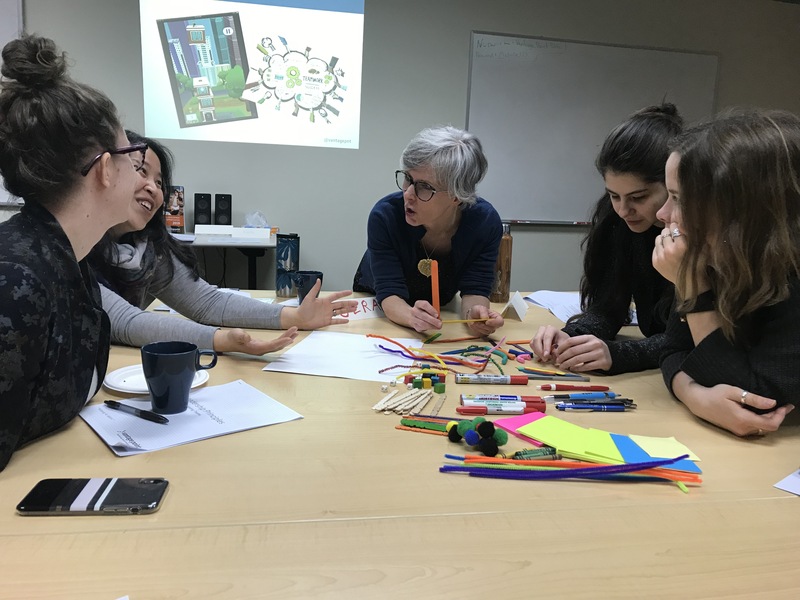 Last month, I had the occasion to collaborate with Isabel Budke to offer Leadership Principles, a 3-part course at Vantage Point for those in the non-profit sector. Isabel facilitated the first and last session, and I did the middle one. This was the first time I had facilitated outside of a higher education context in 15 years, and on a topic (leadership) that I had never presented on in a group. 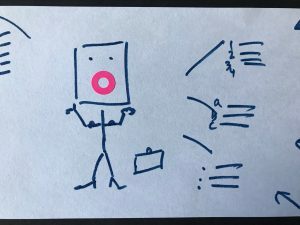 I have noticed that many educational developers share similar facilitation approaches, so being part of a session outside of higher education and also led by someone with a different professional background gave me a few insights/reminders. These are presented below. Extensive group sharing can work. I tend to plan many small group activities and incorporate only limited large group sharing. Isabel did the opposite and I was surprised at how much and how easily the participants shared in the large group. I thought their sharing would dwindle quickly, but it didn’t. Inspirational quotes don’t need to be avoided. In my facilitation (including conferences, workshops), I don’t think I’ve ever used a motivational quote. My assumption has been that an academic audience would not take me seriously and/or would be turned off by these. In the Vantage Point sessions, Isabel used a few inspirational quotes and I noticed that the participants enjoyed and reflected on these out-loud and without prompting. I am prone to worry and plan all my facilitation sessions extensively. Session #2 (the one I facilitated) was no exception. Isabel, too, plans extensively. The difference is that I normally incorporate many activities (for fear that there won’t be ‘enough’) and, in her sessions, Isabel selected only a few activities and allowed more time. It felt spacious, productive, and more relaxing. I consider myself a warm person and I like to connect individually with others. 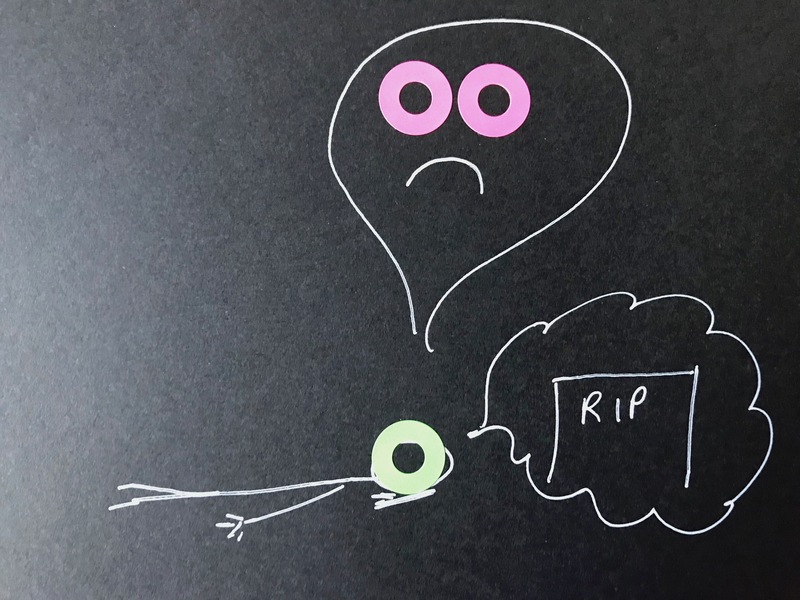 When I facilitate in a group, I think, however, that some of my warmth may be “lost” because I get concerned with The Plan (which tends to be overly ambitious when I’m facilitating something for the first time). I enjoyed seeing how Isabel exuded warmth throughout. What have you learned lately by watching others facilitated? Let me know in the comments–I’d love to hear from you. 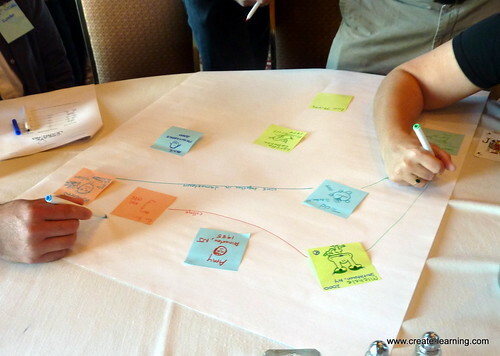 Last week, Lucas Wright and I co-facilitated a session titled “Facilitating Teaching: Approaches and Skills”. For our ice-breaker, we led a speed-friending* activity in which participants had 45 seconds each to respond to the questions below before they switched partners and answered the next question with a new partner. The questions we developed all pertain to the theme of facilitation. (We used only 5 questions because of time limitations). What are 2-3 ways you help learners get to know each other? What are 1-2 things you currently do in your teaching that you think draw on “facilitation skills”. Which ones come most easily to you? Do you like moving fast or slow when teaching? Say more about your pace as an instructor. These words are often heard in the context of teaching and learning: “I want my classroom to be a safe space for learning”. What is your reaction to these words? As a learner, what do you like most about the use of discussion as a teaching approach? What do you like least? What are some techniques you use to memorize your learners’ names? How, if at all, do you use silence, pauses, and/or or reflection in your teaching? (pick one or more. If you don’t use any of these approaches, consider how–as a learner–you use silence, pauses and reflection to further your learning). The full workshop plan, including all our resources, can be found here. Everything is in the open so you are welcome to use this. *Called “speed-friending” only because I have a reaction to the words “speed-dating”. But, on thinking about this more “speed-friending” isn’t much more palatable! 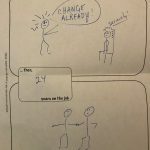 This blog describes how we can use stick figure narratives in our educational development (ED) work. My thoughts on this were inspired by a workshop facilitated by Dr. Jessica Motherwell McFarlane who presented at Symposium 2018. Dr. Motherwell McFarlane uses stick-figure narratives in her role as an instructor and counsellor to explore resiliency. One of the premises of her work is that everyone can draw stick figures; consequently, it is not something that needs to be taught. Brain researchers, she explained, show that we instantly know when we are seeing stick figures and it is as if “a stick figure visual language app” comes with our brain. “Why not use it? !” she asked us playfully. Dr. Jessica Motherwell McFarlane led us through several experiential exercises at the Symposium. In this post, I’ll describe these and consider how I could use these in ED. Within a few minutes of sitting down, we were asked to “show an image” or “make an image” depicting something funny and unexpected that had happened in our teaching. We were given a short time (I think it was 2 minutes) and one rule: We had to use at least one loopy sticker in our image–and we could use as many loopy stickers as we wished. We then got into trios and shared our stories and drawings. I do not remember what I drew; nor what my story was. What I recall is feeling stressed at having to draw right away, having to come up with something “funny”, and the requirement to do so within such a short time limit. I had gone to the workshop because I anticipated it would make me feel uncomfortable–right I was! 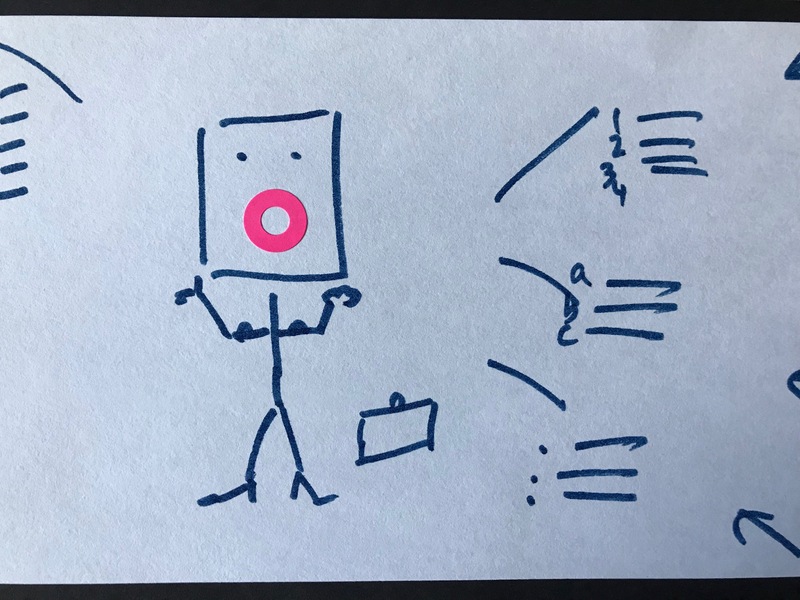 When debriefing this activity, Dr. Motherwell McFarlane emphasized the importance of getting participants to draw almost immediately and of giving people only a short time to do so. She also intentionally avoids using the words “draw an image” because the word “draw” can generate a feeling of anxiety in people. 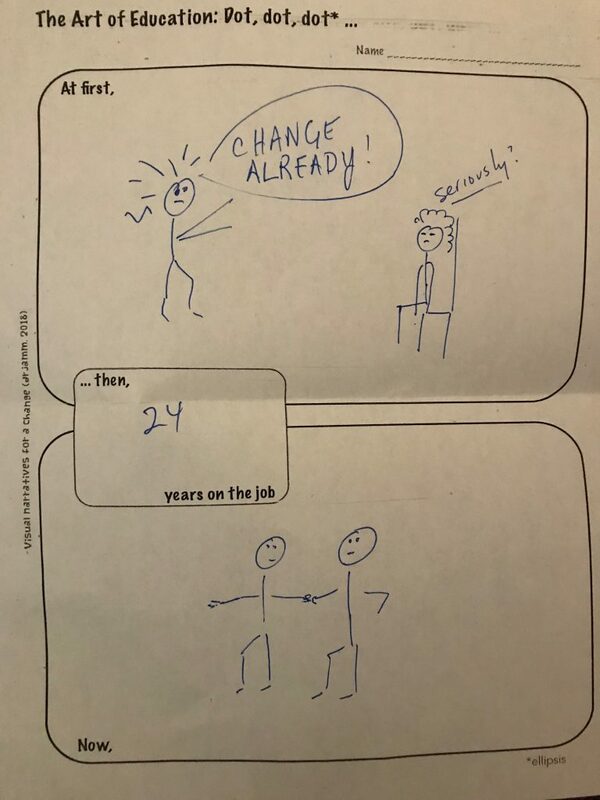 Application to educational development: The activity could easily become “tell the story of something funny or happy or unexpected that happened in your ED work”. This, and the two activities below, could be part of a session promoting reflective practice in ED. We had approximately 3 minutes to create both images and then shared the stories in trios or pairs. Image 1 (the “outside” view) Explained: My Fall has been very, very, very busy. I’ve had so many projects and have been applying my sharpest organizational skills and efficiency to complete these. The figure in this image is me flexing my ED muscles to keep various projects moving. Image 2 (the “inside” experience) Explained: This fall has been one of the most difficult periods in my life as I have been providing intense support to my daughter in her recovery of anorexia (I am sharing this with her permission). I have been drained and sad much of the time. This activity invites the image-maker to show and celebrate an aspect of one’s professional evolution. Think about your role as a __________ (you could use ‘educational developer’; Dr. Motherwell McFarlane used ‘educator’; I considered my role as an adult educator). In the small, middle box, write the number of years that you have had that role (for me, 24 years as an adult educator). Think about a change in you over that period of time. A few people were then invited to share* their Then and Now narratives using the document camera at the front of the room. *Tip: Dr. Motherwell McFarlane has her own travelling (iPEVO HD USB) document camera and advised that it is helpful to assign one person to be collecting images and positioning them properly so that you, the facilitator, can focus on the storyteller and not on futzing with the image/direction/camera. This session was my favourite at the Symposium. If you decide to use stick figures or have thoughts on how you might use them, please send me an email or write a comment — I’d love to hear from you! I’d like to give a BIG thanks to Dr. Motherwell McFarlane who so kindly read through a draft of this post, added details that I had accidentally omitted, and provided other helpful feedback. Good for a large group energizer. Divide the group into 3 and have each sub-group stand or be in a separate area of the room. Position yourself where everyone can see you and assign one group “Ping”, the other group “Pong” and the third group “Ball”. Let the group know that, as you point to a particular group (area of the room), you want the members to shout out “their” group name. 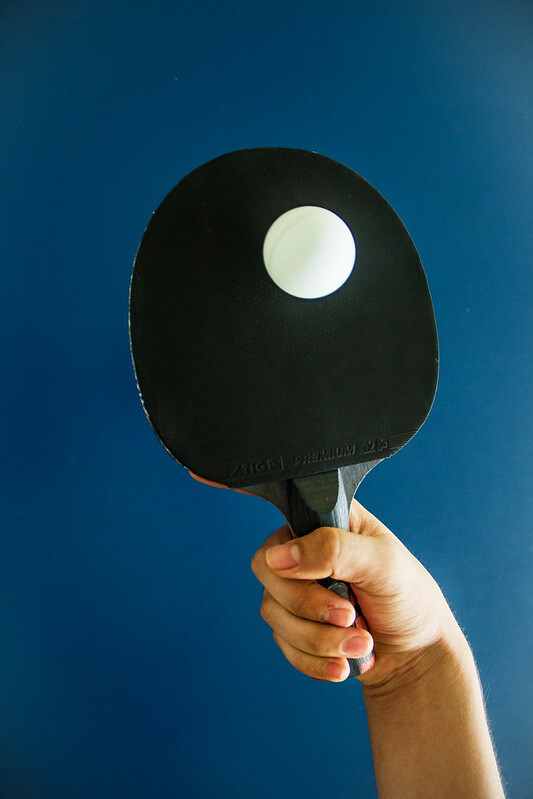 As the conductor, you then point to different groups and can have fun creating combinations of the three words (ping, pong, and ball), i.e., “ping, ping, ball, pong” etc. Good as an energizer or icebreaker for 6 people or more. Everyone stands in a circle. Let people know that the activity consists of taking turns uttering an inclusions statement out loud and stepping into the circle if that statement applies. For example, one person might start by saying “Step in the circle if you prefer going to the beach over going for a hike on a sunny day”; those who feel this is true of them step into the circle. Then they step back out. The next person might say “Step into the circle if you plan to have a glass of wine this weekend” etc. People normally come up with fun statements and this activity always generates laughter. This works well in a group of 25 or more people and is a powerful auditory experience. I know of people who have led this in a large (100+) class,but haven’t tried that myself. This game signifies a rainstorm starting softly and getting louder until it is pouring, with lightning and thunder. The storm quiets down again. First, you silently rub your fingers together, and the participants do the same. Then you rub your two hands together, making a very soft sound, and the participants follow. Next, you clap your hands very softly while the participants follow (it should still be quiet-ish). Now go back to clapping and clap a little louder than you were snapping. Then stomp your feet and clap, making a lot of noise. Now do it in reverse until it is silent again. The instructions above were taken from here. Do you have some fun energizers and/or icebreakers to share? If so, let me know! I was recently introduced to the Ladder of Accountability and think it could be a useful group facilitation tool. As the name implies, the Ladder of Accountability can be used to assess the level of accountability in a group. It can help teams examine an issue that they are dealing with and make some intentional choices about how they want to handle it. The Ladder of Accountability from InfoPro Learning, Inc. Here is one way I imagine using it: I am working with a group and we want to assess where things are at for a particular issue/element of the project. I could ask each of the group members to individually and anonymously circle the rung of the ladder they believe we’re on. A look at the responses would provide the facilitator with a sense of how the group is feeling. The results could be a starting place for a group conversation.